One word to sum it up: Dazzling. Around four years ago, I saw a movie called Transformers. I was basically forced into the cinemas against my will, because I would have rather watched Will Ferrell's latest instead of some movies with cars that turn into big things and shoot things. I couldn't possibly think of anything more boring. However, when I came out of that cinema, I couldn't help but feel I'd had the best time of my life. It was then, I fell in love with going to see big, loud, funny blockbusters at the cinema. I've seen a few big blockbusters since then...The Dark Knight, Inception, TRON: Legacy, The A-Team...to name a few. But none had the same experience as that Bay picture ages ago. That was until I saw Thor. In only my second go at 3D, I was dazzled by the visuals yet engrossed by the story; laughing along with it yet enjoying the great performances; and just having a good time but not being sucked in by any of the big, dumb crap that you usually find in a blockbuster. No, it's not life-changing, but it's a bloody good time, just like Transformers was all those years ago. I, like many people, was probably looking forward to this the least out of all the upcoming superhero flicks. A movie about a guy who throws a hammer around? Please. I could think of more exciting things on a worm farm. However, while we'll have to wait and see what Captain America and such do, I think this is a fine start to the season. 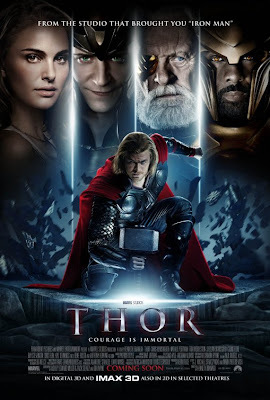 Because, while this movie may have a hammer throwing Norse God (played by Chris Hemsworth) as the lead character, it's actually more exciting than my usual worm farm hangout. In fact, it's more of a human drama examining a fractured family, along with a guy who has come from the top of the ranks to being like us powerless creatures on Earth (just with a few more muscles). And, like always, there is a cute love story thrown in, between MC Hammer...woops, I mean Thor...and that crazy ballerina from Black Swan...woops, I mean Jane Foster (Natalie Portman). All in all, the story is actually quite good. I've always imagined what it would be like to be a Norse God coming to the abyss of our world. We all know that Kenneth Branagh is a bit of a Shakespeare guy. And we all wondered whether the Shakespeare guy could make a highly-budgeted comic book movie. Yeah, I was a little bit sceptical, I'll admit. But Branagh did a brilliant job. Sure, there were a few niggles with his crooked angles and the fact that some of the action sequences were too dark to see in 3D. Branagh, however, may be more at home directing a blockbuster than other blockbuster specialist are themselves. He plays with the budget to get every intended effect that he wants, and there's that feeling that he did it out of true love, which is what many other blockbusters miss. I was surprised at how well he handled the mind-blowing action sequences. The early action sequences in the fantastic looking realm were superb, and definitely left me with little words to say other than "WHOA!" Another thing I was sceptical about was the casting of Chris Hemsworth in the lead role. I know he was in Star Trek and whatever, but I'll always remember him as the hottie from Home and Away (a.k.a Australia's worst soapie) who was always in the teen mags I used to read. Here, he's piled on the muscles and put on a right majestic accent, and is virtually unrecognisable from those days. I quite liked his performance, it may not be earth-shattering, but he was actually really good. If I was expecting a flat performance, he certainly didn't give one of those. There aren't really any stand out performances here. Natalie Portman was pretty sweet in the love interest role, but that was pretty standard. Anthony Hopkins was barely in the thing but he was cool while he was around. Tom Hiddleston was pretty good as the villain in the family, and I can't wait to see more of this actor. Stellan Skarsgard was around for the ride too, and got a few funnies for himself. Kat Dennings got the most laughs, though, with her perfectly adequate depiction of generation technology. I liked it how a few of The Avengers crew decided to come to the party, reminding us that this is a part of something much bigger. Agent Coulson (Clark Gregg) popped up quite a few times, even referencing Tony Stark ("That guy never tells me anything!") while he was around. There were a couple of uncredited cameos from Samuel L. Jackson, in character as Nick Fury, and the brilliant Jeremy Renner, introducing his character of Hawkeye. That was a stroke of genius. On a whole, Thor is a film which doesn't break barriers. There is that feeling that the film never really completes itself as it should, and I do admit leaving the cinemas feeling a bit empty. But hey, if someone had trouble with Iron Man 2, then this would be a much better film to go to. This one isn't as elaborate, and it doesn't have an overcooked amount of characters. Thor just sticks to simple storytelling, like having the main plot partly revolve around a family who doesn't really act like a family, and having the arrogant warrior stripped of his powers (the stuff of the fairytales I read as a child). It's a fun ride, yet it all means something. I imagine, if this film was a little bit longer, then it could have reached the epic heights it should have reached. Once the film ended, I wasn't sure of what I thought of the film. But as I walked out, someone waiting in the line for the next showing asked someone from my showing how they movie was. He said, with an enthusiastic voice: "Brilliant!" At that moment, I realized I agreed wholeheartedly with that statement. THE VERDICT: While Thor may not be as epic as it should be, it's an amazingly fun ride, packed with dazzling visuals, lots of wit and a brilliant human story. Let's just say: you may wanna see this instead of Kate Hudson's latest. I love love love films with spectacular visuals. I also love Transformers, no matter what others say, because just like you I enjoy Michael Bay type movies. And... gosh, your second 3D experience? Lucky you. I'm on board with your Michael Bay statement as when he's on he's second to none. Too bad Transformers 2 was about as bad as anything else he has done. I wasn't looking forward to this really. The trailer does nothing for me but I do love big fun summer blockbusters so you've given me some hope. I did not like either Transformer films, and could not agree more with your first statement. I am going to see this one tuesday, and I hope to enjoy it. Great review! Great review Stevee! I enjoyed it more than I expected also, though I wasn't quite as excited as you were by the end :-p It's a strong blend of drama and comedy, and some of the action scenes (well only one actually) were pretty impressive. Unlike Iron Man 2, which was overblown with villains and characters, this keeps it simple, and is all the better for it. I still think some of the supports had very little to do. Like, why were there four companions that came to Earth? Two did absolutely nothing. Nevertheless, a solid opening to the Blockbuster season! I have to admit I was sceptical about whether Branagh could make a big blockbuster like this, but most of the reviews are praising the film so I'm definitely going to see it now. Lesya - The visuals were way better than I expected them to be. I loved the first Transformers movie, and as I said, I've liked watching blockbusters ever since. Though I know which ones are crap and which ones aren't. 3D isn't as great as people would have you believe. It's cool to have the people looking real and all, but I'd still go for 2D any day. Yeah, the trailer did nothing for me and I only decided to see it when the positive reviews started sifting through. The outcome was great! It was such a good time. Matt - I hope you enjoy it as I did! Andy - Thanks! And I agree with you, it has a great blend of genres! I found myself comparing this to Iron Man 2 heaps. This film is much better than that, as it is so simple and there aren't so many villains, which I liked. But you're right, there were quite a lot of characters, and I felt like we didn't get to know them enough (hence the reason I wanted a little longer with the movie). Some didn't have much to do...but they were still there, like premium extras. It was a great opening to the blockbuster season! Jack - I can't believe someone like Branagh made this film. It's so weird. The reviews are actually only average, though it still holds a really high rating on Rotten Tomatoes, so I doubt this is five star fun, but I thought it was cool! If you don't like superhero movies, then you'll probably have problems with this one. Even though Thor isn't a superhero...he's a God. Part of what I wanted from the film was a guy in armor with a giant hammer smacking frost giants in the face...and so I got that. It was a good time at the theaters, and that's all I asked for. Good review, check out mine when you can! Horray for good times at the movies! Thanks!